Black and creme woven chambray creates a universal backdrop to any color, pattern or style. 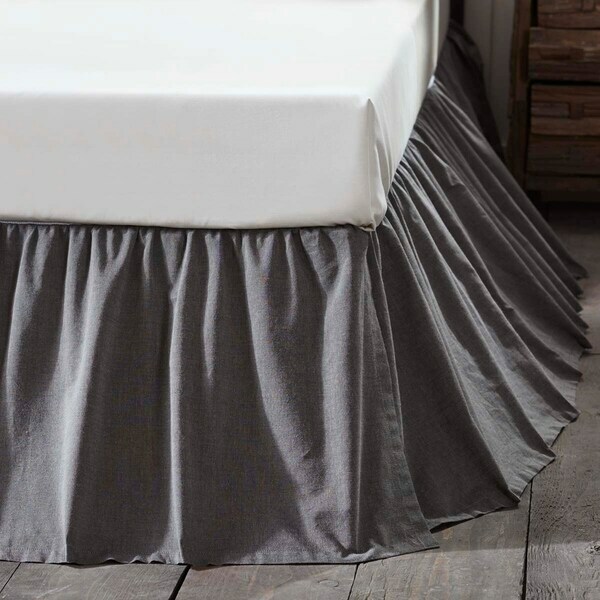 The Bed Skirt features gathered ruffle with 16" drop and finished with split corners. Beautiful color gray. Lays nicely. Could compliment any room. Love the length as well. While meeting much of the criteria in a bedskirt I was seeking, I would not recommend this bedskirt to a friend because the ruffles are not nearly as full nor are they consistently spaced around the bed. At the foot of the bed they are the most full but not as pictured. Along the sides, they are very inconsistently spaced with large flat areas containing no ruffle. I would have returned it but we were in the process of a move and not able to do so in a timely way. The length is good as well as the color. This bedskirt is awesome for as inexpensive as it is. Love the gray color. There was a smell from the plastic packaging so I washed the bedskirt right away before using it and then used an iron to make it look neat. There are a few gathering flaws but barely noticeable. It's deep too. Definitely recommend to others. I love this bedskirt, it is a charcoal gray color in person. If you like the shabby vintage style this is for you. Well had to return because it was not black. I should have looked at it more carefully before I purchased. If the color was right I would have kept it. I love this skirt. It was just what I was looking for. It matches with my lilac sheets and quilt. It’s a nice contrast.